Nurses plan to strike again on the 7th of February in the third of six planned all-out labour strikes. Image Credit: Cáit Caden. Ministers proposed immediate talks with the Irish Nurses and Midwives Association (INMO) about staffing levels rather than pay, as they prepare for their third 24 hour strike. Last week the government threatened over 30,000 nurses and midwives with financial penalties for participating in the first of the planned all-out strikes, over the lack of pay parity. Psychiatric Nurses Association are also taking industrial action today over pay and staffing retention. 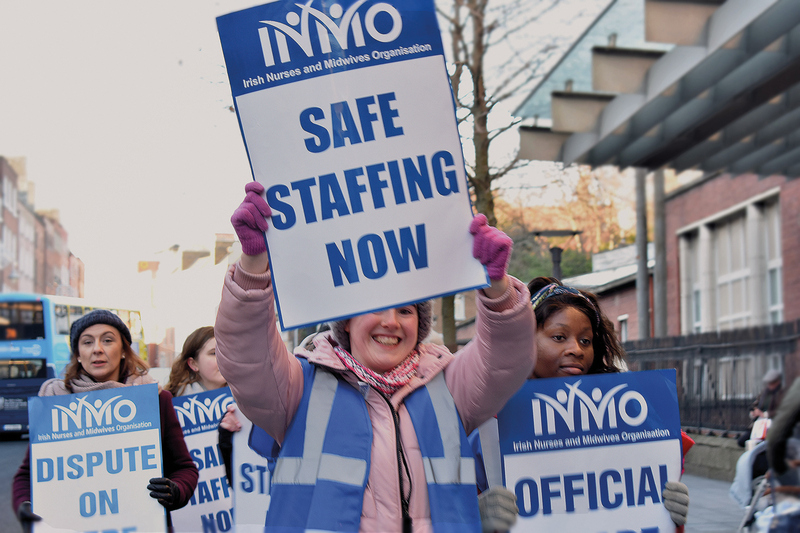 “What we’re trying to say to the government is that they really come out with a rhetoric about respecting nurses but we really need them to demonstrate that in a practical way,” said INMO representative Kate O’Halloran at the Rotunda picket line. “Pay restoration and pay parity with other allied healthcare professionals” would be an effective way for the government to do this, however “they keep telling us there’s no money there but we know there’s money there, it’s about how they spend it,” according to O’Halloran. A lack of pay parity, also known as equal pay for equal work, in Ireland is the main reasoning behind the number of nurses trained in Irish universities going abroad for work. This leads to under staffing and consequently a risk to patient safety, according to the INMO. “They [the Irish government] are training nurses and midwives. They’re putting a lot of investment into their education and training and they’re losing that, and other countries are getting the benefit of these wonderful trained professionals because the environments that they provide in their healthcare sectors are safer and the pay is better,” said O’Halloran. If nurses and midwives continue to strike, it is possible that the government will impose financial penalties such as freezing pension benefits. “The nursing unions are seeking a significant increase in pay over and above all of the benefits of the current Agreement (Public Service Stability Agreement) seeking parity with other health professionals,” said Minister for Finance and Public Expenditure, Paschal Donohoe. “Concession of this pay claim, even if possible, would have serious consequences for the public finances and for public pay policy generally with estimated costs of €300 million annually,” he continued. Thousands of patients were affected by the first labour strike on January 30th and it is estimated that around 50,000 medical appointments were cancelled because of the work stoppage on February 5th. The INMO agreed with the HSE that ‘skeleton’ staff be provided to “ensure emergency and life-preserving care” was still delivered to patients, as stated by an INMO spokesperson who added that “the staff working shifts will be paid fully for their time” during the strike. Those on the picket line at the Rotunda were cheered on by drivers of Dublin Bus and were joined in solidarity by the Irish National Teacher’s Organisation (INTO). “I think for the most part the public respect and support us but understaffed areas make it difficult to give these patients the care they deserve,” said Deirdre Ruane who has been working as a nurse for 40 years predominantly on the Special Care Baby Unit. “One has to wonder is it a historic presumption around it being a vocation and not a profession,” said O’Halloran when asked why the conditions have not improved in nursing over the years. The strike did not include nursing students who were allowed to cross the picket lines however displays of solidarity were organised by student nurses. “I think it’s a shame how DCUSU didn’t organise anything in support of the strike. A photo was posted in solidarity with a very short caption instead,” said DCU nursing student Jessica Collins. “I thought it was a shame as DCU is one of the main colleges in Dublin for Nursing Degrees and it’s a really popular college for nursing as well,” she continued. VP for Education and Placement Craig McHugh was on annual leave at the time of the strike but took part in the organising of the photo.